Chris Petersen is turning OKGs into starting OGs at Washington, proving that the philosophy that helped him build Boise State can work in the Power 5—and reaffirming that the Huskies aren't going anywhere. But Chris Petersen and his staff saw something in Harris that Harris hadn’t even seen in himself. No other FBS coaching staff saw it, either. Cal Poly and New Hampshire had offered scholarships to the Inglewood, Calif., native who played in Orange County at Junipero Serra Catholic, but no one in the Mountain West wanted him. Certainly no one in the Pac-12 besides Washington did. Some of those Pac-12 schools got interested after Washington offered and Harris committed in the summer of ’15, but that speaks more to Petersen’s pet peeve of staffs only issuing scholarship offers based on which other programs have offered—not on the coaches’ belief that the player can succeed at that level. But Washington coaches believed in Harris, who might be the quintessential OKG. But Harris held his own. He did more than that when he wasn’t playing early-round draft picks. He did that at 270 pounds. Now he’s 293, and he has spent an offseason focusing on the lessons learned in that Peach Bowl. For instance, he learned that while his height may have been a detriment during his recruitment, it can help him against a stronger opponent by allowing Harris to get lower and use his leverage to neutralize the defender’s strength advantage. 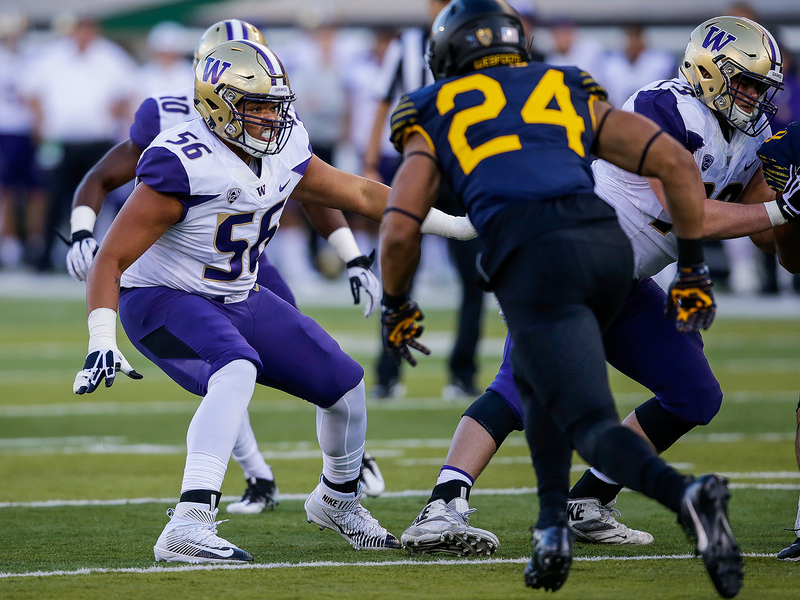 After starting on Washington's line as a 270-pound true freshman, Nick Harris has bulked up and grown from his trial by fire. Players like Harris are the reason why Washington’s 2016 Pac-12 title and playoff berth won’t be isolated incidents. When Petersen moved from Boise State to Washington, we wondered if he could duplicate the same kind of consistency. We also wondered if he could unearth as many underrecruited gems when he needed his signees to play at a higher level. It turns out he can. The trick is to combine those gems with more heavily recruited counterparts. It turns out Petersen can do that, too. Byron Murphy, the highest rated member of that ’16 class that included Harris, redshirted last year and looks ready to step into one of the Huskies’ open cornerback spots. To Petersen, Murphy and Harris were both players Huskies coaches had scouted, evaluated and declared to be OKGs. He would have been just as interested in them no matter who else recruited them. That isn’t the case for many of Petersen’s counterparts, who hand out scholarship offers the way campus pizza joints hand out coupons on the first day of class. Still, Petersen doesn’t intend to change how he and his staff evaluate. They’re still looking for for the next Shea McClellin or the next Harris, no matter who anyone else wants. If they keep finding them and combining them with the four- and five-star players they now have access to at Washington, they’re going to keep winning for a long time. Yes, there were a few games this past weekend. But since the bulk of college football opens this week, let’s pay tribute to something else that used to start in September: the TV season. Peak TV has changed the rhythms of the TV year, but this is when we used to get all the new shows. Some of them would run for weeks and get canceled. Some of them would run for years and become cultural touchstones. So in honor of a week of debuts—and a lot of working out of the kinks—here are the top 10 TV pilots of all time. The show begins with Dr. Jack Shephard opening one eye. A plane crashed on an island. Then things got weird. They had to make things up as they went along as the seasons dragged on, but the first episode was magic. We see the pants first. Then the Winnebago. Then we learn how chemistry teacher Walter White got into this mess. By the end of the half-hour, we were all rooting for Kevin Arnold and Winnie Cooper. This one would have worked as a feature film, but instead we got more Crockett and Tubbs every week. We meet Don Draper doing some market research on behalf of client Lucky Strike. Then we meet him with a woman. Then we realize that woman isn’t his wife. The onion keeps getting peeled from there. It felt like every single kid at my school was quoting the Homeboy Shopping Network and Men On Film the morning after the pilot aired. Homie the Clown and Fire Marshall Bill would come later, but it was clear this show was going to be different. This short-lived ABC show couldn’t keep up the momentum, but its first episode features the kind of world-building every pilot should aspire to. The stakes are established immediately as U.S. Marshal Raylan Givens dares a criminal to pull first. The resulting shooting gets Givens transferred back home to Kentucky. He quickly gets matched against childhood acquaintance Boyd Crowder, who would be his nemesis for the entire run of the show. Lots of shows start by throwing a combustible new character into a world where the other characters are familiar with one another, but combustible new characters don’t get much better than a jilted Diane Chambers. Jason Street gets hurt. Matt Saracen becomes QB1. We all fall in love with Coach Taylor and Tami Taylor. The game is an ESPN production sponsored by vitamin company Advocare. So ESPN, Advocare, NRG, BYU and LSU must agree on a new venue. The parties hoped to have a location chosen by Monday afternoon. Candidates include the Superdome in New Orleans and Tiger Stadium at LSU. This is the second time in two seasons a hurricane will force an LSU game to be moved. After a pointless spitting match of a negotiation that should have been handled quietly by the SEC office instead of noisily by the two schools, the Tigers’ game at Florida was moved to November in Baton Rouge last year because of concerns about Hurricane Matthew. LSU lost that game and now has to play Florida in Gainesville this year and next year. 3. The most exciting game of Week Zero was Hawaii’s 38–35 comeback win at UMass. It might have been more exciting had UMass actually attempted to win the game on the final play. I had planned to go somewhere besides Seattle’s best hidden Japanese joint, but the Internet had failed me with regard to when my intended destination was actually open. So I consulted the various apps—which I realize had just failed me—and sought something in walking distance that would dazzle my tastebuds. Up popped Tsukushinbo. It was only two-tenths of a mile away from where I stood. The reviews glowed. Get sushi, one said. Get the donburi, another said. If they have fresh fish, get that, said another. But they all contained warnings. This place doesn’t have a sign. So don’t walk right by, one said. They take reservations by phone, but they don’t always answer the phone, another said. Good luck trying to walk in, said another. Indeed, the place had no sign. Its address—515 South Main Street—didn’t appear to be visible. But 517 stood to its left and 513 stood to its right, so this had to be the place. When I walked inside, closing time was in 90 minutes. The tiny dining room was packed. So was the sushi bar. Four people with reservations stood outside. A server who also acted as hostess and floor manager noticed me and asked if I was Tommy, who presumably had been wise enough to make a reservation. No, I said. I was a humble party of one. I didn’t know if there would be any seats before closing time, but I was intrigued by a place that looked like any other generic sushi bar but inspired fervent allegiance from people throughout a city known for its Japanese food. “Maybe in an hour,” she told me. “Maybe not” was implied, and it hung in the air as I stood outside and watched people with reservations fill recently emptied tables. After about 45 minutes, I worked my way back inside. Several diners seemed close to finishing. I might have a chance. Suddenly, she walked through the dining room and pointed at me. There was one seat at the sushi bar. It was mine if I wanted it. After watching happy diners at the bar put their meals in the hands of Chef Sho with the chef’s sushi selection ($50 a person), I know what I’ll do on my next trip. But the reviews of everything else had been so effusive, I couldn’t commit only to sushi. (Or, if I’m there on a Friday morning, I’ll get the ramen. They only make it Fridays for lunch, and they only make about 20 bowls.) I ordered a pork belly donburi (rice bowl) and a Marine roll (scallop, spicy sauce, mayo, flying fish roe and avocado rolled in rice and topped with seared salmon, sea salt and lemon). I tried to order a broiled amberjack collar, but I’d come too late. Don’t worry, my server said. They still had king mackerel. The king mackerel came first, and at first glance it seemed it had been burned to a crisp. But as I watched the assistant sushi chef use a torch to kiss fish with a touch of heat, I realized it wasn’t burned at all. The inside was hot and juicy, and the outside had been torched to create a glorious crispy skin. This served as the ideal appetizer for the heartiness to come. The donburi from Tsukushinbo in Seattle. The donburi came next. Grilled hunks of pork belly mingle with onions and sesame seeds in a sauce that would be too hot for most diners if not for the sunny-side up egg atop the meat. 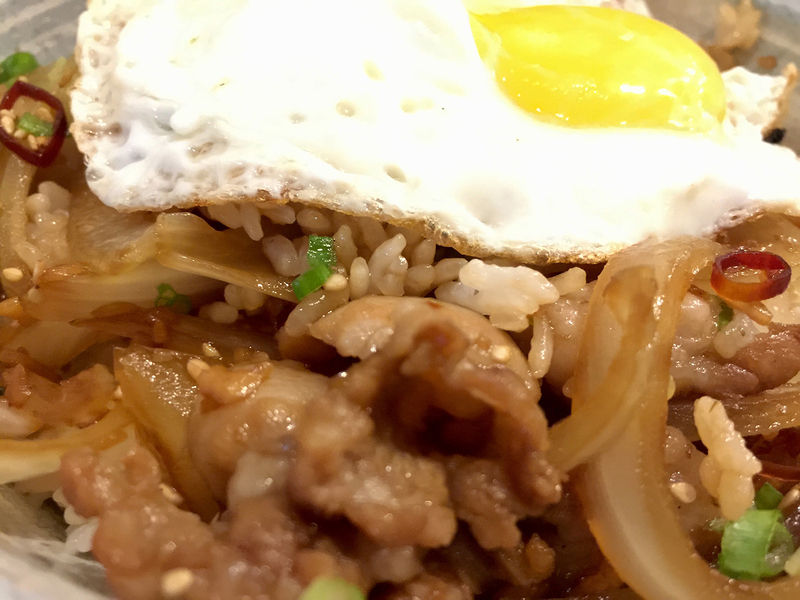 Break the yolk and let it slide down past the meat and into the rice. Then stir. The egg will temper the kick of the sauce just enough. After that, every bite will balance spicy, sweet, salty and savory. The bowl will seem to grow after a few minutes. That’s O.K. You’ll want to keep eating. 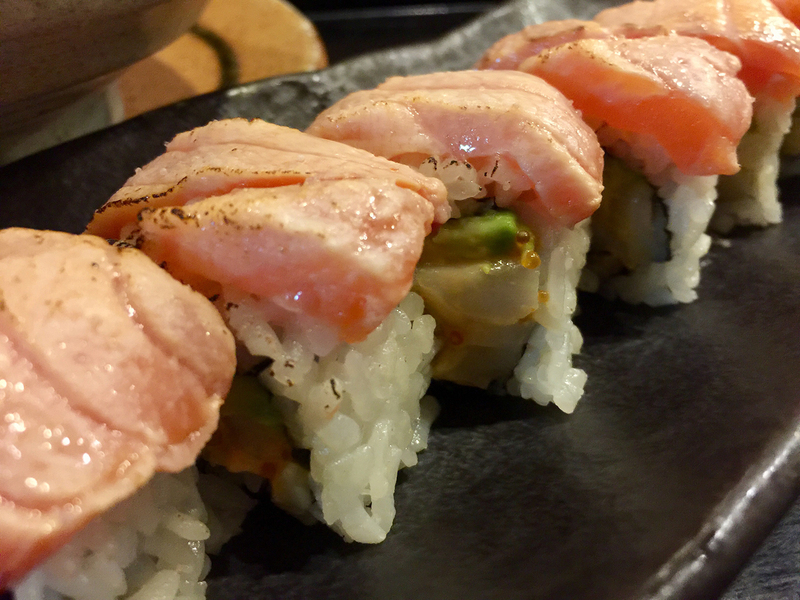 The Marine roll from Tsukushinbo. I’m not afraid of raw fish. In truth, I hadn’t noticed the line on the menu that noted my roll had (semi) cooked fish. I was intrigued by the sea salt and lemon, and I skipped past the “seared.” No matter. This particular roll was excellent. The avocado provided a lush backbone, and the drops of lemon juice highlighted the freshness of the flame-kissed salmon. I wished I hadn’t eaten so much donburi, because I wanted to try every piece of sushi on the menu. I washed it all down with Samurai Barley Ale from Japan’s Swan Lake Brewery, drinking the last drops as the sushi chefs sheathed their knives and cleaned the counter. I had stumbled into this secret place and been lucky enough to get a taste. Next time, I’m coming prepared.